Posted: Tue Dec 12, 2017 6:36 am Post subject: What was the easiest harvester combine to work on ? Just for fun I thought it would be interesting to see the answers to this question. My father said his jd 45 round back was his. Have fun! Posted: Tue Dec 12, 2017 6:39 am Post subject: Re: What was the easiest harvester combine to work on ? Posted: Tue Dec 12, 2017 7:06 am Post subject: Re: What was the easiest harvester combine to work on ? I don;t know what was easiest but the Massey 26 was extremely hard. Posted: Tue Dec 12, 2017 7:27 am Post subject: Re: What was the easiest harvester combine to work on ? We had a JD 45 early on, and it wasn't hard to work on, but the Gleaners were a little easier. Posted: Tue Dec 12, 2017 9:05 am Post subject: Re: What was the easiest harvester combine to work on ? I've looed at some old cleaners and they do look like a dream compared to the million belts on one shaft jd out on their 00 combines lol! I've read massey is a nightmare to work on!!! Posted: Tue Dec 12, 2017 10:34 am Post subject: Re: What was the easiest harvester combine to work on ? Posted: Tue Dec 12, 2017 11:15 am Post subject: Re: What was the easiest harvester combine to work on ? Gleaners, they had to be since you had to work on them all the time. Posted: Tue Dec 12, 2017 1:24 pm Post subject: Re: What was the easiest harvester combine to work on ? Any of the self propelled Gleaners, hands down. behind the shields, I about passed out from shock. I couldn't believe how many belts and chains there were, and how many were stacked on each shaft. Posted: Tue Dec 12, 2017 1:35 pm Post subject: Re: What was the easiest harvester combine to work on ? I've read that part of the reason the Gleaners are so simple (bearings, drives, etc) is because they were designed initially for custom cutters, and knew excessive down time wouldn't be welcome on the big harvest runs. Posted: Tue Dec 12, 2017 1:59 pm Post subject: Re: What was the easiest harvester combine to work on ? Any JI Case combine is easy to work on. Very few belts and chains to complicate the machine. Posted: Tue Dec 12, 2017 4:14 pm Post subject: Re: What was the easiest harvester combine to work on ? Gleaner R2 series and newer hand down. All drives on the outside of the machine. Can pull rotor very quickly. Posted: Tue Dec 12, 2017 4:20 pm Post subject: Re: What was the easiest harvester combine to work on ? Posted: Tue Dec 12, 2017 4:22 pm Post subject: Re: What was the easiest harvester combine to work on ? (quoted from post at 14:59:53 12/12/17) Any JI Case combine is easy to work on. Very few belts and chains to complicate the machine. this is good to know! 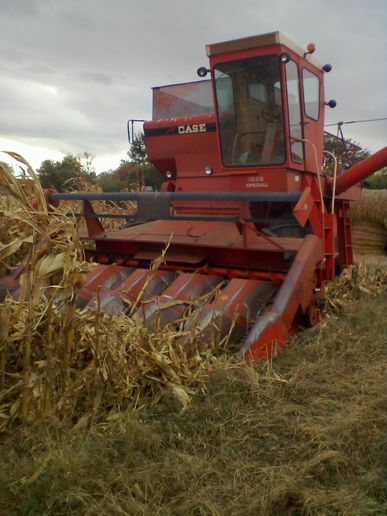 I'm currently looking to buy a very nice ji casr case 600 combine in illionis. I was wondering about the number of belts and access to things on them! Posted: Tue Dec 12, 2017 5:00 pm Post subject: Re: What was the easiest harvester combine to work on ? Posted: Tue Dec 12, 2017 6:03 pm Post subject: Re: What was the easiest harvester combine to work on ?